Welcome to our hydraulic elevator tech tips section. Here we encourage your community contribution by submitting your own hydraulic elevator technical tips. Ever get stuck in a difficult situation? Want to share some of your expertise? Go ahead and submit your tip with the form below and we will add them to our wiki! Does my shut off ball valve WOG rating meet ASME A17.1/CSA B44? Have you ever used a dual valve single pump configuration? Warning…this is not a recommended pump unit configuration. With this configuration there is no way to isolate the valves in the up direction preventing proper valve adjustment and reaching your desired ride performance. If your specifications result in a need for two valves and a single pump was called out, please contact Maxton to explore other alternatives. Have you had to replace a Maxton valve or two because you skipped this critical step? So you lost a pump a short while ago and then the valve stopped working correctly so you replaced that too. Then the new valve began to malfunction in a matter of days. Based on Maxton warranty return inspections we find that during the process described above most often the tank was not cleaned, oil was not filtered, nor was the oil replaced. Basically, the oil contamination (root problem) that put the job out of order originally was not addressed and perpetuated the problem. Moral of the story…haste makes waste! Don’t get me wrong…Maxton sells a lot of valves when critical steps are skipped like this, but we all benefit more from a job done right the first time. What is causing this hydraulic elevator modernization to stop so harshly? Often this problem raises its ugly head when an old dry power unit on the overshoot and re-level system is modernized with a submersible power unit. The intent is to speed up flight times in the up increasing passenger flows. The problem is short cuts are often taken that produce uncomfortable harsh stops making customers unhappy with the elevator ride. In order to prevent harsh stops in this modernization example you must remember that the dry power unit operates differently than a submersible when stopping on the pump with overshoot and re-leveling to the floor. Basically, the dry pump unit has fly wheel spin that makes a slow stop while the submersible pump stops almost immediately. So when replacing a dry unit with a submersible you must add hoistway slowdown switches, a controller upgrade to get the increased passenger flows and maintain the soft stop by stopping on the valve not the pump. If the costs to do this are prohibitive and the customer wants comfortable stops then replace the old dry unit with another dry unit and forgo the increased passenger flows. What is the best way to have a Maxton valve rebuilt? Do you know what the “S Port” is for and how it can benefit your arrangement of control valve components? 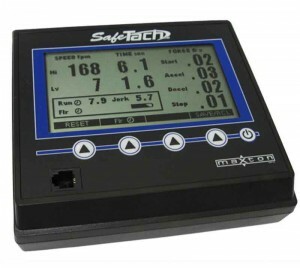 Did you know SafeTach / SafeTach2 (Start, Accel & Decel) readings provide optimal valve adjustment settings? Maxton provides the optimal valve adjustment range in the adjustment procedures based on SafeTach readings for each Maxton valve. For example, the UC4 series DT (down transition) setting says:Register a down call and turn DT IN (CW) so that the car slows to provide 4 to 6 inches of stabilized down leveling. (Decel 0.04g-0.09g).The range in bold is the SafeTach decel reading you should see when the valve is properly adjusted. A softer ride will be on the low end while a firmer ride is on the higher end of this range. When troubleshooting or adjusting a valve are you using the 20 minute rule? Are you making this common Maxton valve adjustment mistake? Down Leak or Oil Shrinkage…how to tell the difference? Can you set BPS with just one man? How can I tell how fast the car is moving without a tachometer?